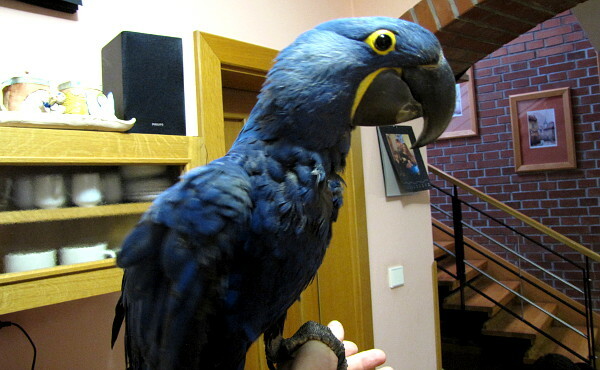 Fifteen years – so long Jaroslav and Lucie Jelinek have been waiting for the first Hyacinth Macaw breeding (Anodorhynchus hyacinthinus). Finaly, their time came in the last year and the patience was definitely worth it. They bred five youngers from one pair! The success could be even better as the female laid 8 fertile eggs in four clutches. However, three embryos died in eggs. 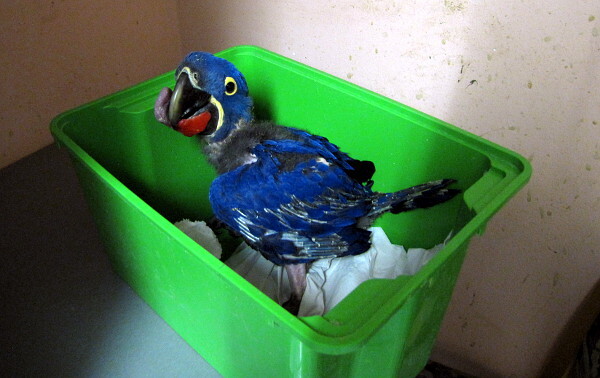 How has that breeding of 5 Hyacinth Macaw babies in one year happened? In my opinion, we have been just lucky. When you acquire a young pair of Hyacinth Macaw ( Anodorhynchus hyacinthinus ) you have to keep them till they are sexually mature, birds have to get on well together. We have only one pair of this species so we can talk about an enormous piece of luck. So you bought your breeding pair as a young pair? Yes, they were 6 months old. Since that time they have been still together. We haven’t dealed with any health issues. How long have you been waiting for this moment? In the last year, they were 13 years old. In previous years they have had two unsuccessful breeding seasons with one infertile clutch and one hatched chick. Unfortunately, they didn’t feed it so it died. So when they start nesting? The breeding pair is hand-feeded or parent-raised? They were hand-feeded from the first day. Five babies, it’s a lot! How many eggs did you have in the last year? We had eight eggs in four clutches (4 x 2). All of them were fertile. From the first clutch two babies arised, from the second, third and fourth „only“ one at a time. Four fertile eggs didn’t hatch or chicks died soon after they hatched. So you could have 8 babies in total? Why haven’t you tried to let parents raise their chicks? We had bad experience from previous seasons because they didn’t feed their chick for the first time. However, if they will breed again we try it for sure. All eggs were incubated artificially? The first clutch was put after 2 weeks under a proven breeding pair of Military Macaws (Ara militaris) as they had three eggs at that moment. The next clutches were under their biological parents up to the 22nd day. Then we put them to the incubator. You didn’t let foster parents start feeding chicks and take them to hand feed later? Military Macaws feeded Hyacinth Macaw chicks ( Anodorhynchus hyacinthinus ) for three days. However, we couldn’t put the next clutches under this or another breeding pair of macaws later as they didn’t have their own eggs at that time. What was the timing of nesting? If we take the eggs up to 21st – 23rd day of incubation, they will lay the forst egg of the next clutch soon. What mixture did you use for hand feeding? From the first day we mix Nutribird with Kaytee for macaws in ratio 1:1. As for consistence, we follow instructions recommended by producers. How long after the hatching did you feed the chicks? The first feeding occurs when the yolk sac is absorbed. If the chick has still green feces we give it the fennel tea. When only uric acid is released then we start feeding it with very sparse handfeeding mixture. In what age the babies are weaned? We noticed that your oldest baby has 7 months now. 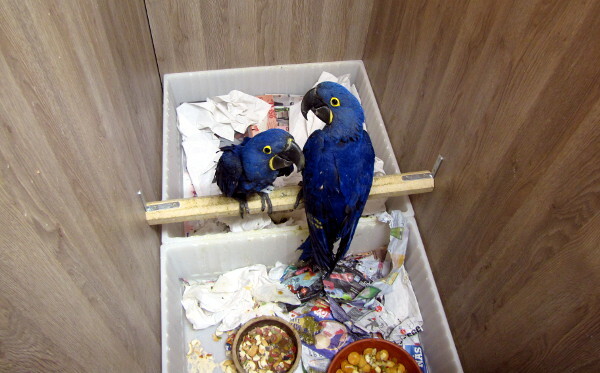 Some breeders wean Hyacinth macaw babies already at the age of 6 months. I would say it’s too early. Seven to eight months is an optimal period to my mind. In the wild it’s very similar and that’s why pairs nest there only every second year. How frequently have you been feeding the babies? At the beginning, every 1,5 hour, 24/7. By the time the interval has been lengthened according to the crop size. We fed 3 times a day, eventually (since the age of 3 months). When we start weaning, one feeding is left out and we learn the baby to eat by itself. When you wean the youngers, what food do you use? We wean birds with pellets, sponge biscuits and cut fruits (mostly apples and bananas). What temperature do you keep in the brooder when chicks are not feathered yet? After hatching we set the temperature on 36°C and then reduce it by 0,5°C every week. When you compare hand feeding of Hyacinth Macaw with other macaws species, is there any difference? I would say it is easier than some other macaws. I would say that Military Macaws, Red-fronted Macaws (Ara rubrogenys) and Blue-throated Macaws (Ara glaucogularis) are more difficult to hand feed for sure. In those cases we faced troubles with digestion for several times. Do you have any other „handfeeding“ experience with Hyacinth Macaw (Anodorhynchus hyacinthinus)? Yes, I hadfeeded a few babies of this species for my friend Zdenek Spalek so I did have some experience. We noticed a beak brace in the youngest baby. It’s generally known that Hyacinth Macaw hatch with deformed beaks quite frequently. How is that? Nobody knows. Some breeders say it’s because of food. I don’t believe it. In my opinion, it’s mostly in the case of the last hatched youngers. Last eggs can be poor in calcium or other components so it doesn’t grow properly then. Hopefully, the brace which our vet applied should work. How old was the baby when it got the beak brace? I contacted the vet when the baby was 6 weeks old and she put the brace on its beak immediately. Is it necessary to change the brace when the beak is growing? No, it’s fixed by screws on the lower mandibule and how the beak is growing the brace fall off. Do you think there is any chance that the beak will be fixed without any consequences? Both birds in my breeding pair had deformed beak. At the age of 5-6 years, nobody would say that their beak was wrong. Let’s go talking about your breeding facility. It’s quite unique that the inner part is more spacious than the outside flights which are very small (every outside flight is only 1m long x 1m wide x 1,5m high). Why have you decided to build such design? Before I decided, I had spoken with several successful breeders around whole world. To my and their mind, in smaller aviaries birds are more willing to breed. 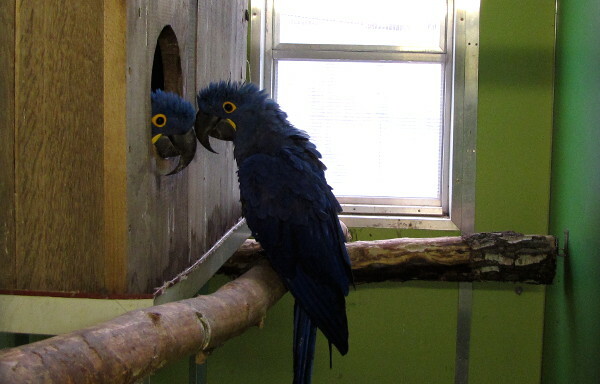 You breed Hyacinth Macaw in one facility together with other macaw species. Aren’t they disturbed by other pairs? Whole collection is together at one place for a long time. Of course, sometimes I buy a new bird but 80% of macaws in my collection are together for 10 years. How do you stimule your birds to breeding condition? From spring to autumn I feed with sprouted seeds. But in the past I have tried to leave this component out and there wasn’t much difference. So in my opinion, sprouted seeds are not an important trigger for breeding in macaws. Generally we feed with various fruits and vegetables, pellets and a seed mixture. We add pulses as well. Do you prefer your own or commercial seed mixture? Commercial mixtures only, we use Avicentra. Kaytee for big parrots or ZuPreem. What kind of fruits do macaws like? And what nuts? Macaws should get a diet high in fat content. Do your Hyacinth Macaw get the same nuts as other macaw species? Four clutches in one breeding season – quite tough for the female, don’t you think? Will you reduce their breeding within this year? I didn’t force her to lay the eggs. Contrarily, I would prefer less clutches so she is not exhausted. In my opinion, she was in a very good condition. Otherwise, she wouldn’t nest. So you didn’t try to close the nestbox? No, it doesn’t make any sense. 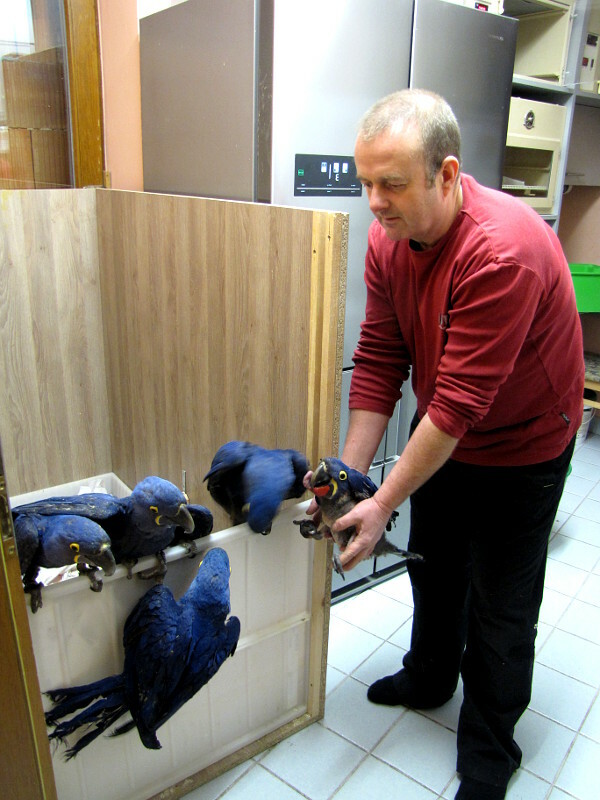 Reproducing of Hyacinth macaw is their natural need. If the birds are in good condition they would breed. Some macaws don’t nest for several years at all, some pairs nest once a year, other pairs twice. It always depends on their condition. Have you ever experienced so many youngers from one pair in one year? Such record I remember in Blue and Gold Macaws, I had 12 babies in three clutches within one year. Do you heat your facility? Some breeders believe that some species have to „freeze“ in the winter so they breed in the spring. Do you believe this theory? We heat our facility in the winter, but maximally on a few degrees above zero. Your facility is built from insulated panels, does it work well? I’m a joiner so it’s the best choice for me. It’s a very good material. Very fast to build, especially the roof. 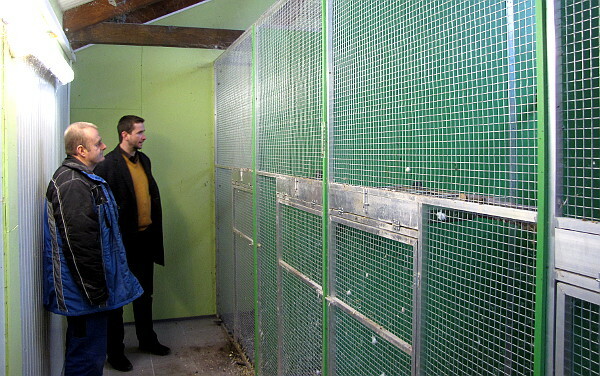 What is the size of your inside aviaries? They are 3,5m long, 1,5m wide and 2,5m high. You use classic mesh 19x19mm with thickness of wire 2mm. Don’t you worry that Hyacinth Macaw will destroy it? They won’t. The only species which destroyed this mesh was the Buffon’s Macaw. 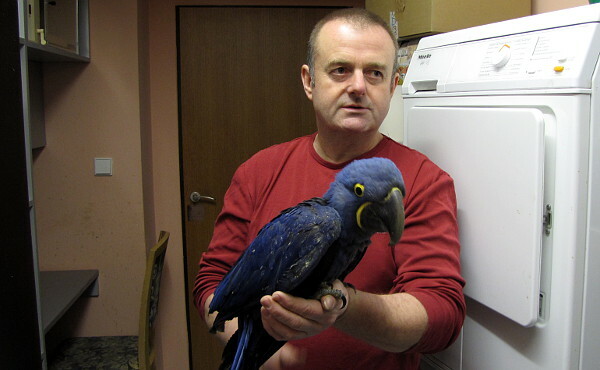 Besides Hyacinth Macaw ( Anodorhynchus hyacinthinus ), which species have been difficult to breed in your collection? It’s funny but at the beginning I would say that Blue and Gold Macaws. I bought a young female and 3 years after a male. Then we waited 12 years for the first offspring. And that female was your first macaw? Word of advice on Kaytee ? Dont use it anymore as it has made some of my breeder friends bird sick and even caused death to many so please dont use Kaytee has improper calcium dosage and will harm bird reproductive organs !